From what I can tell, this is not the team trophy from 1970. It is, according to my best guess, only a replica of the actual team trophy. Just as every member of a championship team usually receives a championship ring, it is not unheard of for a team to give out smaller replicas of the team trophy (although they are still pretty rare). *Note – The Ivy League Football Championship Trophy is a “Static/Traveling” trophy. It travels from champion to champion each year and never takes on a new shape, form, or design. 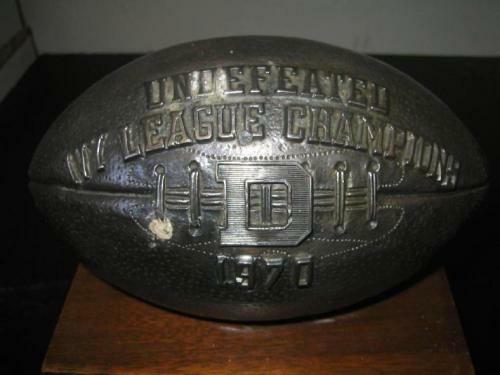 So in this case, this trophy was created by Dartmouth to commemorate their 1970 Championship season (and was not given to them by the Ivy League). Dartmouth most likely made one main trophy for the school and replicas for each player, coach, etc. This is common among teams in a conference with a static trophy, as they want something to display in the trophy case if they have to give up the official conference trophy the next season. This Dartmouth trophy apparently belonged to Alex Turner (Halfback), as you can plainly see from the plate on the front of the trophy. I don’t know exactly how this ended up on eBay but I have a pretty good idea. However, I do know that it was not Alex Turner who was selling the trophy. As for the actual team trophy that belongs to Dartmouth, I have not seen it or found any info on it, so I can’t say for certain that this is an exact replica, or what the scale comparison is. You can see from the pictures of the trophy that it is quiet worn and well used. The wood base is in good solid condition, but you can tell it has been banged up a bit. The front of the base has a heavy plaque showing the outcome of each game from the 1970 season, along with two circles — both containing University logos or seals. 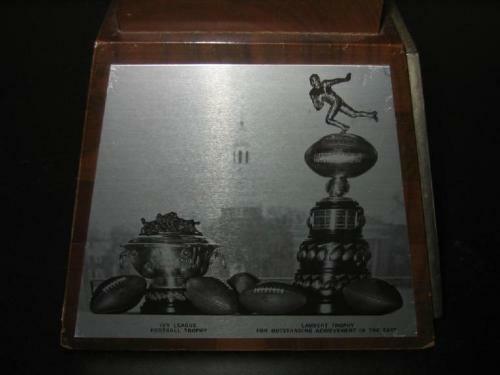 On one side is a picture (on metal) of the Lambert Trophy (see below, on right) and the static Ivy League Football Trophy (below, left). Across the back of the trophy is a large team photo in black and white. 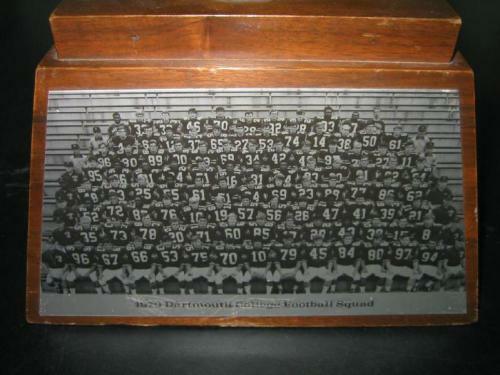 Across the bottom of the team photo it says “1970 Dartmouth College Football Squad.” This lettering across the bottom is a little hard to read due to some heavy scratches across the wording. I don’t know if there is (or was) a photo on the fourth side of the trophy. My guess is that there was a photo there at one point in time, however it has since been damaged or has broken off, otherwise it would have been displayed in the auction listing. Finally, sitting on top of the trophy is a large metal football with very nice detail (as you can see by looking at the laces of the football). This is the most impressive part of the trophy. The raised letters and large/centered Dartmouth “D” is very impressive. If anyone reads this and has more info on the trophy, please leave a comment below. I would love to hear from you. 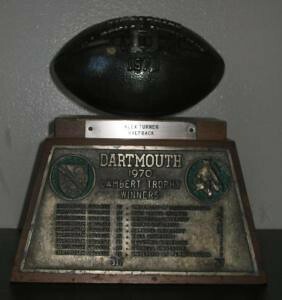 This was an original trophy given to all members of the undefeated dartmouth 1970 football team (instead of rings). It is not a replica, but an original design. Coach Blackman preferred to give out trophies to championship teams. 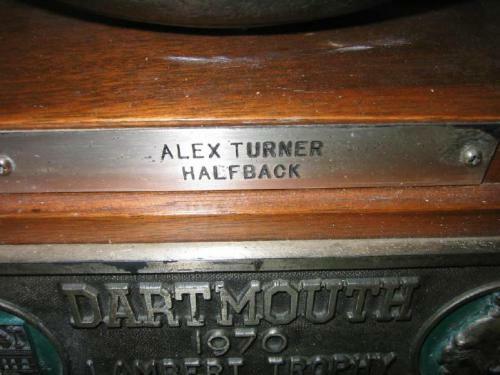 Alex Turner was a sophomore letterman on the team. I am Alex Turner’s daughter and this post was just recently brought to our family’s attention. We would love to find out more about the trophy’s owner and see if we can bring it back to the family. If you have any other information, please reply to this post. Anything would be appreciated. Thank you – the Turner Family. I responded to Alexis’ comment on my blog asking how I could get in contact with her. Unfortunately, I never heard back from her. My boss played running back for this team. He has the trophy in his office but he also has a championship ring to go with it. This entry was posted in 2012, CFBIndependent-CrystalFootball, eBay, Trophy by Travis Normand. Bookmark the permalink.